I bring you greetings from Massachusetts, where I serve as Missioner for Creation Care in the Episcopal Diocese of Western Massachusetts and in the Massachusetts Conference of the United Church of Christ. I took a train to get to Washington, D.C., this weekend, but I feel as if I sailed here on the living waters of the Holy Spirit. I was carried here, called here, moved to come here by a power greater than myself. Like John Wesley, my heart felt “strangely warmed” and called by the Spirit to be here at this critical time in world history. 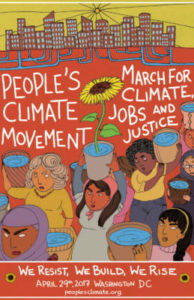 Yesterday’s historic “March for Jobs, Justice and Climate” drew me, and many of you, and something like 200,000 other people to converge on our nation’s capital to express our shared love of life and our fierce intention to fight for a habitable planet, a just society, and a healthy future for our kids. We were like a mighty river, pouring through the streets in all our variety and diversity, a wave of people standing up for life, including people who had never done anything like this before, people who had never protested in the streets, had never taken part in public witness, yet who now felt moved to connect with others and to say that now is the time for our country to change course. Now is the time for fossil fuels to stay in the ground. Where does such a beautiful wave of faith, hope, and love come from? Where does it begin? A mighty river has to begin somewhere, and if we hike upstream and follow a river back to its headwaters, we probably discover that even a great river starts as something very small – maybe nothing more than a trickle, a bit of moisture on the ground, a trace of dampness in the soil. Yet eventually that rivulet of water becomes a power to be reckoned with. A great wave of Easter hope poured like a river through the first followers of Jesus – a mighty surge of confidence that the crucified Jesus had risen from the dead, that he was alive through the power of the Spirit, and that life, and not death, would have the last word. But that great wave of hope likewise began in a very small and humble way. We learn this, for instance, in today’s Gospel story. 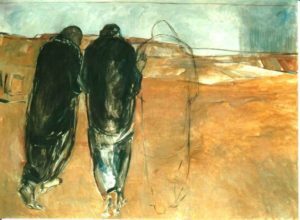 Two dejected followers of Jesus are walking to Emmaus. This is not a big march, but a mournful amble by two people who feel lost. Cleopas and his unnamed companion – who might be his wife, but who might also represent you or me – the two of them are walking together, talking about their confusion and sorrow. The person they had loved and followed, and who had ignited their hopes, has been executed. Jesus has been handed over, condemned to death, and crucified. The powers that be have triumphed. Injustice has won the day. I wonder how deep their despair went. Along with the grief that someone they loved had been tortured and murdered, did they also wonder if they had been fools to follow him in the first place? Did his message of God’s mercy, justice, and love now seem absurd? The movement that had formed around the power of Jesus’ love, teachings, and presence seemed to have been defeated forever. The government, like unjust governments everywhere, had tried to destroy the Jesus movement by arresting and killing its leader, figuring that without its leader, the movement would lose heart and dissipate like water into sand. So here they were, on the road to Emmaus, two followers of Jesus feeling shocked, helpless, stuck, and sad. Sure, some women of their group had told them an astounding tale that Jesus’ tomb was empty and that they “had… seen a vision of angels who said that he was alive” (Luke 24:23) – but what did that mean, and how was that possible? I want to pause here, because it’s important that we find ourselves right here in this story, without jumping ahead. I don’t know about you, but for me, the climate crisis can evoke similar feelings of grief, helplessness and fear, for we are witnessing (and complicit in) a crucifixion of another kind, the crucifixion of Earth. 97% of climate scientists worldwide are reporting with increasing alarm that climate change is upon us. Unless we take action fast, we will leave our children a world that none of us would recognize, a world very difficult to inhabit. In a mere 200 years – just a blink in geologic time – human beings have burned so much coal, gas, and oil and released so much heat-trapping carbon dioxide into the atmosphere that levels of CO2 are higher than our species has ever experienced before. Last year was the hottest year on record, crushing the record set the year before, which in turn crushed the record set the year before that. As global temperatures rise, every living system of the world is affected and in decline. Sea ice is melting rapidly at both poles. Land ice is melting and sliding into the sea. Tundra is thawing and releasing methane – a dangerous greenhouse gas. Storms are becoming more intense. Droughts are spreading in some areas, extensive floods in others. The ocean is absorbing heat and excess carbon dioxide, and in just decades has become 30% more acidic. Scientists recently reported that large sections of Australia’s Great Barrier Reef have died. The climate emergency is not just a quote-unquote “environmental” problem. It’s not just about polar bears and coral. It’s about people in Southern Africa, where rains have failed, crops are withering, and starving families are “reduced to eating cactus and even rocks or ashes.” It’s about Pacific islanders whose homelands are already flooding from rising seas. It’s about impoverished people here and abroad who are hit first and hardest by a changing climate, who have the fewest resources to adapt to it, and who are the least responsible for causing it. To make matters worse, fossil fuel groups are working very hard and spending millions of dollars to keep the American public confused. The same folks who once spread doubt about the risk of smoking tobacco are now throwing their weight behind efforts to mislead the public about the reality of climate change. We learned this week that a think tank known for attacking climate science is mailing out books to public school teachers across the United States, books which contend that climate scientists have not reached a consensus on the causes and the urgency of global warming – when of course they have. 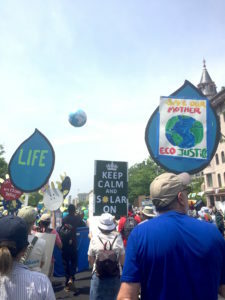 Given the climate emergency in which we find ourselves, and the political and corporate powers lined up to deny there’s a problem and eager to maintain business as usual, do I ever find myself walking beside Cleopas on that sorrowful road to Emmaus? You bet I do. It is easy to feel overwhelmed and to get stuck in fear or inertia, uncertain about what to do and doubtful that it’s worth doing anything, anyway, since, after all, maybe it’s too late, maybe we’re too far gone, and what difference can one person make? Paralyzed by fear, we can get caught in something like a death spiral, in what U.N. Secretary General Ban-ki Moon has denounced as a “global suicide pact.” But then something happens: “Jesus himself came near and went with them” (Luke 24:15). The Lord of life is walking beside his grieving, frightened friends. What’s so poignant and even funny about this part of the story is that the sorrowing disciples don’t recognize the stranger beside them. They even rebuke him for apparently not knowing that Jesus has just been crucified and that strange reports are circulating that he has risen from the dead. But though they are not yet aware of it, the risen Christ is with them, walking beside them, patiently listening to their sorrows. Maybe that is how our own awareness of Christ’s resurrection begins. 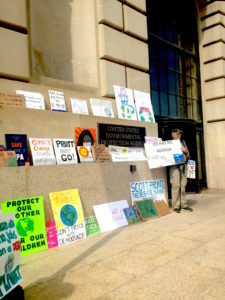 As we pour out our grief about the climate crisis, as we pour out our protest that the web of life is unraveling, we sense that a sacred Someone is listening to us. That is how the risen Christ often comes: he draws near, he walks beside us, he listens to us – and we begin to realize that we are not alone. A divine presence and power is with us. Or maybe, like Cleopas and his companion, we begin to sense the risen Christ as we study Scripture and come to understand, as the first disciples did, that these sacred texts speak of a suffering love that the powers of this world can never destroy. But in order to come fully into our lives, it seems that the risen Christ needs to know that we actively want his presence – that we are willing to reach out and ask him to stay. That’s what happens in our Gospel story. Christ starts walking ahead of Cleopas and his companion, and going on, as if leaving them behind. They call out to him strongly, “Stay with us” (Luke 24:28-29). And this is just what he does: “He went in to stay with them” (Luke 24:29). Maybe we sense the risen Christ most vividly right here at this table, when we share in the sacrament of Communion, when we take, bless, break, and share the bread. That is when the eyes of Cleopas and his companion are opened: they recognize the risen Christ, and in that moment of recognition, he vanishes. Why does he vanish? Because the disciples have been transformed. Because they have fully taken in his presence. Because their own Christ selves have been awakened, and they are now seeing with the eyes of Christ, feeling with the heart of Christ, serving with the hands of Christ. “Were not our hearts burning within us?” (Luke 24:32), they say to each other, as they reflect on what just happened. They have received what we might call a unitive vision, an experience of union with God. They see now that their lives are filled with meaning and purpose. They know now that they belong to a sacred mystery that is larger than themselves: to a love that will never let them go. Although they are still mortal and frail, just two small people in a big, chaotic world, they understand now that they are part of a long story of salvation to which they can contribute, every moment of their lives, by choosing compassion over hate, kindness over cruelty, love over fear. This insight is a great gift. And it is also a choice and a discipline that we try to renew every day and in every aspect of our lives Tired as they are that night, the two disciples get up and head straight back to Jerusalem to share this astonishing news with their friends – only to discover, to their further amazement, that their companions have independently had the same experience: a divine love has been set loose in the world, a love that nothing, not even death, can destroy. That is the wave of Easter hope that filled the early disciples and that set them on fire to bear witness to the risen Christ and to resist the forces of death in the world around them. That wave of Easter hope fills us and carries us now – every one of us who feels impelled to join our Creator in re-weaving the web of life and in building a gentler and more just society. And so we marched yesterday, and we will keep on marching. We will lobby, we will advocate, and we will press our politicians to keep fossil fuels in the ground, where they belong. We will block the path of new fracked gas pipelines, we will push for a fair price on carbon, and we will work to build a clean green economy that provides decent jobs and improves public health. The Church was made for a time like this – a time when God is calling us to become an Easter people, to step out of despair and inertia and to join – maybe even to lead – the joyful, justice-seeking, Spirit-led, unstoppable movement to protect the world that God entrusted to our care. Alleluia! Christ is risen! The Lord is risen, indeed! Alleluia! 1.Naomi Oreskes and Erik M. M. Conway, Merchants of Doubt: How a Handful of Scientists Obscured the Truth on Issues from Tobacco Smoke to Global Warming; see also Ross Gelbspan, The Heat is On; and Union of Concerned Scientists’ 2007 report on ExxonMobil.